From the main event list, location is still started with command 'l', and a new window pops up. Plotting in MULPLT, multi trace mode,' l' can also be used as before, but now the locater window comes up. Figure 4.20: Example of locating an event, the locator window. When the Locator window pops up, a location has already been made and the results of the location is shown. These results are the same as given when locating with EEV, however more results are shown than locating with EEV, where one has to look in the print.out file to see all results. The results are latitude, longitude, depth, origin time (all with errors). Dx(km), Dy(km), Dz (km) and Dot (sec) are the difference in location from previous solution in longitude, latitude, depth and origin time. The GAP and number of stations (NSt) are also shown. The upper right corner shows the magnitude/settings window, see below. The location, as shown in the locater window, must be saved (use button Save) in order for the results to saved in the data base (S-file). It is thus possible to do test without committing the results to the data base. In the Locator window, it is also possible to go to next and previous event without returning to the main window. However, when going to next event or previous event, no location is done and the data shown is taken from the S-file. Locate must be pressed to locate. There is also an option for Save and Rename under File tab. This option will update the S-file name and the ID line to correspond to the origin time. Outside SE this can only be done with program UPDATE, see UPDATE to see why this is done. Option 'u' in EEV is not changing the filename and ID, only updating result in S-file. Under the tab Edit, it is possible to copy the epicentre location to the paste buffer for use elsewhere. Figure 4.21: The options under Settings in the magnitude box. RMS is color coded in a similar way. If any problem with the phases, the name of the Phase shows an exclamation sign (!) as shown above. This is also the case with Magnitude and Azimuth tabs. The average magnitudes are shown in the Locator window, upper right and corner. 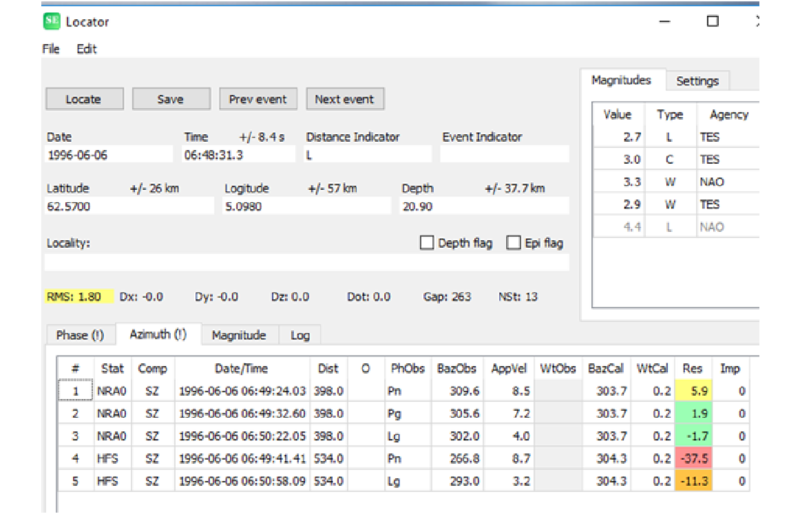 All magnitudes available for the event are shown so magnitudes on additional header lines are included. The magnitudes are sorted in importance as specified in parameter file SEISAN.DEF. The magnitudes not calculated by SEISAN are shown with less contrast than the magnitudes calculated by SEISAN. The 3. magnitude on the header line, which might not be calculated by SEISAN, is considered a SEISAN magnitude. This magnitude is often put in an external reliable reference magnitude. The magnitudes not calculated by SEISAN (not including 3. Magnitude) area t ten of the list. For each magnitude calculated by SEISAN, it is possible to show the individual station magnitudes with the magnitude residual by pressing the Magnitude tab. See Figure 4.22. Figure 4.22: The magnitude window with magnitudes per channel, corresponding input data and magnitude residuals. Additional abbreviations: MagType: Magnitude type, Amp: Amplitude (nm or nm/s), Coda: coda length(s), Moment: Log seismic moment (dyn cm) and Mag: Magnitude. 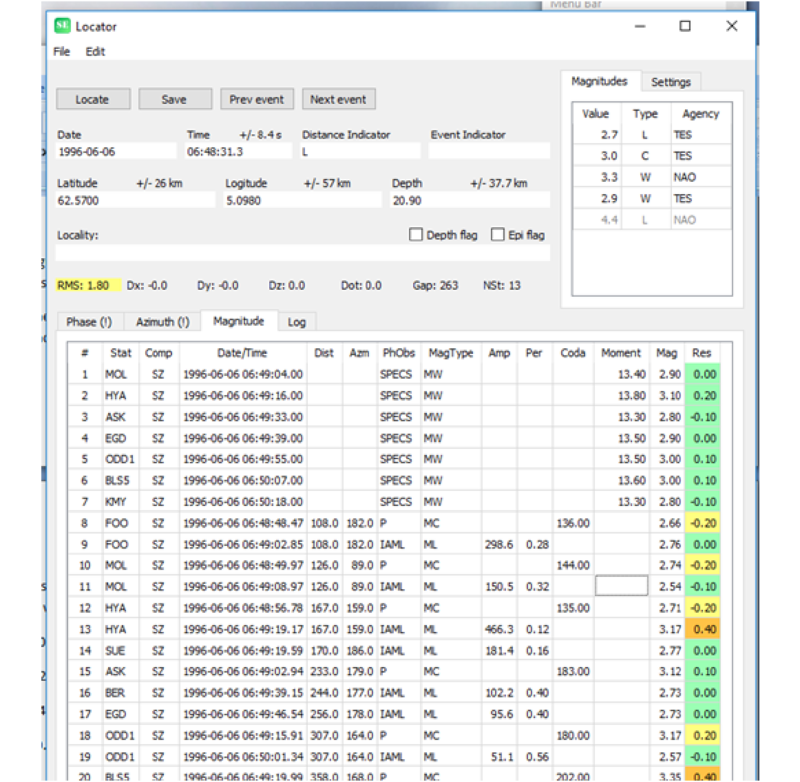 Figure 4.23: The Azimuth (backazimuth) tab. Additional abbreviations: BazObs: backazimuth observed, AppVel: Apparent velocity (km/s) and BazCal: Calculated backazimuth. This tab will automatically come up if the location routine returns a message (like a missing station, errors in station file or if the event cannot be located). In the last case, it is often useful to check the print.out file to get an explanation for why the location was not possible.